(Re)insurance has a key role to play in protecting society from the impacts of extreme events, and in helping others take action to reduce emissions or to adapt to climate effects. The heat is on and the time for action is now. The climate is changing and we, as a society, have a clearer view of how damaging the impacts could be and what could be done to mitigate the effects. Failure to act now will have substantial repercussions for society and for future generations. (Re)insurers are playing their part as they work with societies to help prepare themselves for the physical and transition risks ahead. 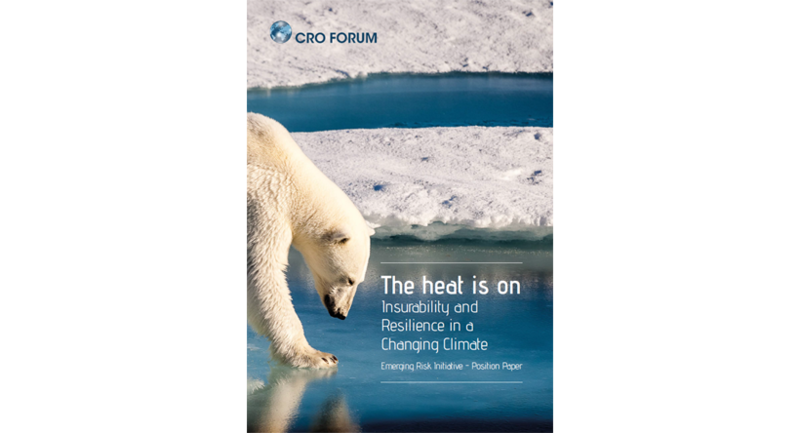 The CRO Forum’s latest publication, The heat is on: Insurance and Resilience in a Changing Climate, provides insurance CROs and other stakeholders with an understanding of the impacts, and equips them to challenge their businesses and others on their responses to climate change. Protect customers from the impact of physical perils. Provide risk management advice, and support mitigation, resilience and adaptation solutions. Maintain insurability, sustaining the real economy by planning ahead with governments, industry and society. Remain resilient, to continue supporting our customers. Provide long-term investment, including existing efforts to support greener technologies and transition activities. The CRO Forum focuses on developing and promoting industry best practices in risk management. Comprised of Chief Risk Officers from multinational (re)insurance companies, it aims to represent the members' views on key risk management topics, including emerging risks. It regularly publishes practice and position papers on timely risk management subjects. Frieder Knüpling, Group Chief Risk Officer of SCOR, currently serves as Vice Chairman of the CRO Forum.